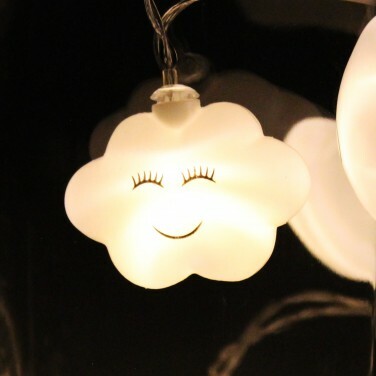 Playful lighting for kids rooms, these sweet little cloud lights shine with a warm white glow for a cosy atmosphere at night. 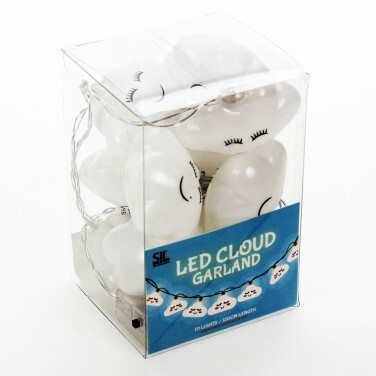 A fun way to add a touch of reassuring light to children's rooms, these adorable little cloud string lights shine with a warm white glow to offer extra reassurance and a cosy atmosphere at night. Battery operated, place these sweet stringlights anywhere in your child's room transforming the mundane into a beautiful lighting feature with little shining clouds with a a dreamy expression. Because they're lit by LEDs, these adorable lights remain cool to the touch making them perfect for use in kids rooms.